Updated: May 4, 2010, 7:30 a.m. E.T. The failed effort to blow up Times Square with a homemade bomb Saturday night, May 1, makes clear that we have entered a new age of terrorism. 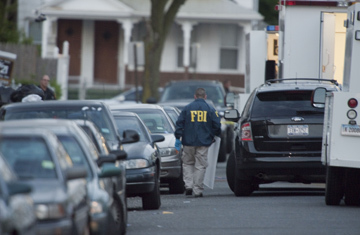 Even as the investigation moved quickly with the arrest Monday night of a naturalized U.S. citizen from Pakistan, evidence increasingly suggests the plot was amateurish, crude  and small-scale. One of the most unheralded victories in 9/11's wake may be that the U.S. and the world community have succeeded in atomizing the terrorism threat, leaving only its shredded remnants  and crazed copycats  to carry out such attacks. In a press conference early Tuesday morning, U.S. Attorney General Eric Holder said Faisal Shahzad, a 30-year-old man living in Connecticut who had recently returned to Pakistan, was arrested at JFK International Airport trying to fly to Dubai. "It's clear," Holder said, "that the intent behind this terrorist act was to kill Americans." The U.S. Attorney's office in Manhattan, handling the case, said Shahzad would appear in court Tuesday, but the charges were not made public. A federal law-enforcement source told CNN Shahzad nearly made it out of the country. "They just caught him at the last second," according to the source, who claimed Shahzad was on board and the Jetway had been pulled back when the plane was called to return to the gate. Whether Shahzad had ties to a foreign terrorist group or not, officials following the case earlier observed that the failed bombing seemed poorly plotted. Evan Kohlmann, a terrorism expert at Flashpoint Partners, was most struck by the amateurishness of what he calls "this so-called bomb." The alarm clocks designed to trigger the blast were 1960s-era technology. "Every terror group, every homegrown extremist cell, knows how to use remote detonators," he says. "It doesn't take a Ph.D. in electrical engineering." Beyond that, Kohlmann adds, its overall design  clocks setting off fireworks to ignite gas and gasoline  "doesn't exist outside of Tom and Jerry cartoons." But just like the failed Christmas airline bomber, the dud of an SUV bomb in the heart of Manhattan highlights both good and bad news on the terrorism front. It showed how ordinary bystanders  two sidewalk vendors, Vietnam veterans in this case  can play a critical role in America's latest war. President Obama telephoned Duane Jackson, one of the vendors, on Monday to thank him for alerting police. Representative Peter Hoekstra of Michigan, the ranking GOP member on the House Intelligence Committee, also praised him. "Compare that," Hoekstra told Fox News, "to how the Army responded to Major [Nidal] Hasan"  who killed 13 last November at Fort Hood  "where they saw all of these warning signs over a period of months and did nothing." The attacks also revealed just how dumb some would-be terrorists are and the critical role of luck in thwarting such attempts. The sputtering bomb, the use of nonexplosive fertilizer (even ammonium nitrate fertilizer, like that used by Timothy McVeigh in the 1995 Oklahoma City bombing, needs to be mixed with fuel oil to be capable of exploding) and the fact that authorities now have possession of the intact SUV and its supposedly explosive innards  all are wins for the good guys. But that's no cause for relaxation, because both cases have revealed holes in U.S. defenses. The U.S. response since 9/11 has smashed much of al-Qaeda's terrorist infrastructure, forcing it to mutate into a collection of so-called franchisees who embrace the movement's goals and look to the Internet for inspiration. The U.S. military's pounding of al-Qaeda elements in Afghanistan and Iraq, plus a crackdown on the movement's fundraising, has crimped its ability to launch major attacks. But it has also pushed adherents to plot smaller ones that are tougher to stop, including the Fort Hood shooting and the attempted Christmas Day airline bombing. "The nature of the threat in the U.S. has undergone a fairly significant transformation since 9/11," says Bruce Hoffman, a terrorism analyst at Georgetown University. "We face a more disparate threat." The nation's expectations about preventing such attacks may be too high. "Even a more modest attack can have disproportionate psychological and policy effects on the U.S.," he says. "We have to have realistic expectations  we can't defend every target against every kind of attack all the time." The SUV found in Times Square had been crammed with dozens of M-88 firecrackers, three gas-grill-like propane tanks (their on-off valves twisted shut), a pair of jugs filled with gasoline and a metal locker packed with fertilizer. The contraption was wired to a pair of travel alarm clocks, designed to blow up the vehicle and anybody close to it in an immense fireball. But this feat of junior high engineering leaves one question hanging: If this were al-Qaeda, wouldn't it have been easier to replace this Rube Goldberg apparatus with a single, devout suicide bomber?